If you’ve read my post Coconut Oil for Horses – Top 10 Uses you already know I love using coconut oil for my whole family, including feeding coconut oil to horses. But one question I get all the time is “doesn’t it cost a fortune?” and it certainly could, but the good news is it doesn’t have to! 💲 This specific brand of coconut oil is most popular with my readers, and available on Amazon! In my search to find the most affordable, high quality, coconut oil I was referred by one of my favorite wellness bloggers to Healthy Traditions. I’m so happy with their products (and prices) that I wanted to share this savvy shopping tip with you as well! Now you can feed your horses coconut oil daily to maximize the benefits, without blowing your feed budget. The best tip I can give is to BUY IN BULK. For feeding horses I’d recommend the either the Organic Expeller-Pressed Coconut Oil or the most economical option, 100% Pure Coconut Oil. Both of these have the advantage of being affordable and have no coconut scent, which your horse may prefer (although mine like both!). For more feeding tips see my post Coconut Oil for Horses – Top 10 Uses. For home use I love the Gold Label Virgin Coconut Oil, and it’s by far the most natural tasting oil my family has tried (and we’ve tried a LOT!). Some people prefer the Green Label Virgin Coconut Oil, which seems to have a milder flavor. Both are a great for everything from cooking & baking to skin care. As an added bonus if you order from Healthy Traditions by clicking on any of the links on my site, and are a new customer, you will receive a FREE copy of The Virgin Coconut Oil Book, and I will receive a discount coupon for referring you. Thank you for using these links and supporting the Savvy Horsewoman website! 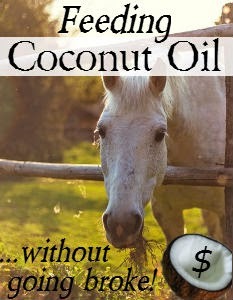 Do you feed coconut oil to your horses? Thank you. I checked out the links and they have some really good deals. Grocery stores here charge an arm and a leg. Haha, I know what you mean. It would cost me hundreds of dollars more if I used the tiny, expensive containers from the grocery store. Online shopping is the way to go! I have a rescue mare that needs some help with gut healing. Should I use the Gold Label Coconut Oil? The website said its the highest in anti-oxidants. Would that benefit a horse too? Yes! I'd highly recommend feeding Gold Label Coconut Oil, if you can afford it. You could always use it for the short term until the digestive issues are resolved, then switch to Expeller-Pressed. Check out the weekly sales page at Tropical Traditions as they often have great discounts. Hello! I have stated giving my horse coconut oil in his feed. I am finding that dealing with the semi solid is somewhat challenging and I'd like to ask if feeding the fractionated version that stays liquid would be safe and just as healthy or is that process removing something necessary? I use the fractionated oil in his fly/conditioning spray. I would like to know this too!!! Beware! Some horses are allergic to coconut oil. I used it recently on my horse's mane and tail and the next day he was experiencing an allergic reaction. Thanks for the warning! That's the first I've heard of a coconut oil allergy in horses, but it's better to be safe than sorry. Always start with a small amount and keep an eye out for reactions.